Ashton Kutcher milks a goat for Lenovo. Lenovo, the Chinese tech giant, has launched a global ad campaign starring its product engineer Ashton Kutcher. The campaign, the first DLKW Lowe has created since picking up the global account in July this year, advertises the brand’s Yoga tablets, which are adaptable so users can use them as a laptop, as a stood up screen and as a tablet. 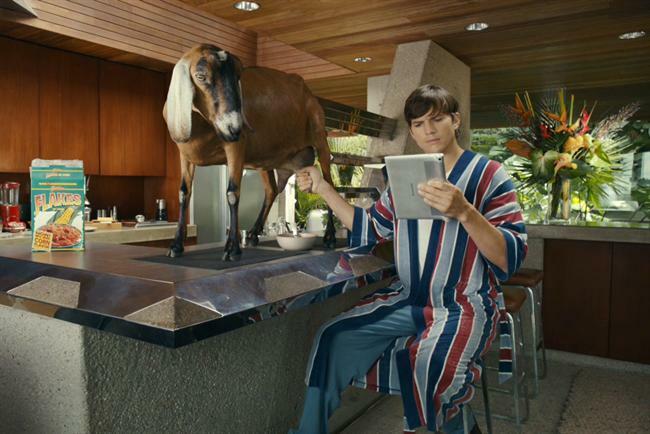 One of the ads, "goat," shows Kutcher milking a goat into his cereal as he checks up on the stock market on a Yoga tablet. In another ad, "onesie," Kutcher, who recently became a father for the first time, is knitting an octopus onesie. Amber Casey and Lovisa Silburn created the campaign and the spots were directed by Dom & Nic through Outsider. The director of photography was Steve Chivers, Framestore handled the post production and Wave Studios was behind the audio. Kutcher balances a tablet on his stomach while painting a picture of a beaver in "toes," while in the fourth, "massage," Kutcher is on a massage bed using a tablet on the floor for video call while a small man in a wrestling outfit massages him. This article was first published on campaignlive.co.uk/.